This export method can be used to save your output using Personalized Print Markup Language (PPML). PPML strongly reduces the complexity of the print-job, especially when color, images, and personalised elements are being used. PPML allows content creators and print providers the greatest flexibility in the design, development, exchange, and production of variable data documents. The following figure shows the available settings for this export method. In the first field you have to specify the folder where you want to save your document(s). If the folder does not exist yet, make sure to check the option "Create if not exists" so that variaDoc can create a folder for you. If you want to create a compressed .zip file with the resulting document(s) inside, check the 'Create ZIP file' box. 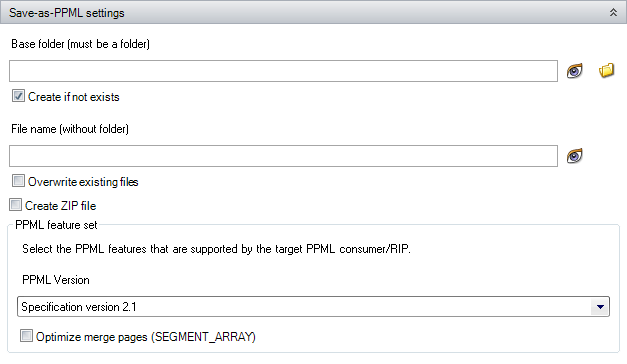 In the PPML feature set window, select the correct PPML version used by your consumer/RIP.